Back when we wrote about using apple cider vinegar as part of a regimen for training your hair to be less greasy, one commenter had a very astute question: Is apple cider vinegar safe for color-treated hair? It's a known remedy for when you're feeling sick, but based on experience, it burns like crazy when you toss it down the ol' hatch, so it seems unlikely that our precious bleached and dyed strands would be able to tolerate the acidity. This would be a shame, though, since ACV has the ability to balance your hair and scalp's pH, cleanse the scalp, smooth the cuticle, and add shine. But because we’re never ones to deliver advice based on mere supposition, we turned to the experts. The experts we consulted agree that apple cider vinegar is safe for all hair types, including color-treated hair. "Apple cider vinegar rinses are really truly about removing buildup of products, and they make the hair really clean,” Jo Blackwell-Preston, founder and master stylist at Dop Dop Salon, says. Which is great, but also precisely what our clarifying shampoos do, and if we were to use those all the time, our color would certainly suffer. So what’s the difference? Apple cider vinegar, while being acidic, is only slightly so—just enough to balance the pH of your hair (and scalp), not strip it. And because it’s a chelating agent, apple cider vinegar grabs the minerals and metals (mostly from hard water) that build up and dull your hair. “The apple cider vinegar coats the cuticle, leaving the hair soft and shiny,” Joico celebrity colorist Denis de Souza says. “It also helps to strengthen your hair by closing the cuticles and the hair shaft.” Shiny hair, healthy scalp, and unclogged hair follicles—it’s an all-around do. To try the rinse, grab a water bottle with a squirt top, and fill it with one to three tablespoons of apple cider vinegar for every cup of water. Use it in the shower on wet hair, just as you would shampoo. Our experts also say you don’t have to worry about overdoing it—using it a couple of times a week isn’t going to harm your color, though de Souza did caution against using it too regularly if you have especially sensitive skin (start out with the 1:1 ratio if you do). Experiment with frequency and solution concentration to find what works best for your hair. 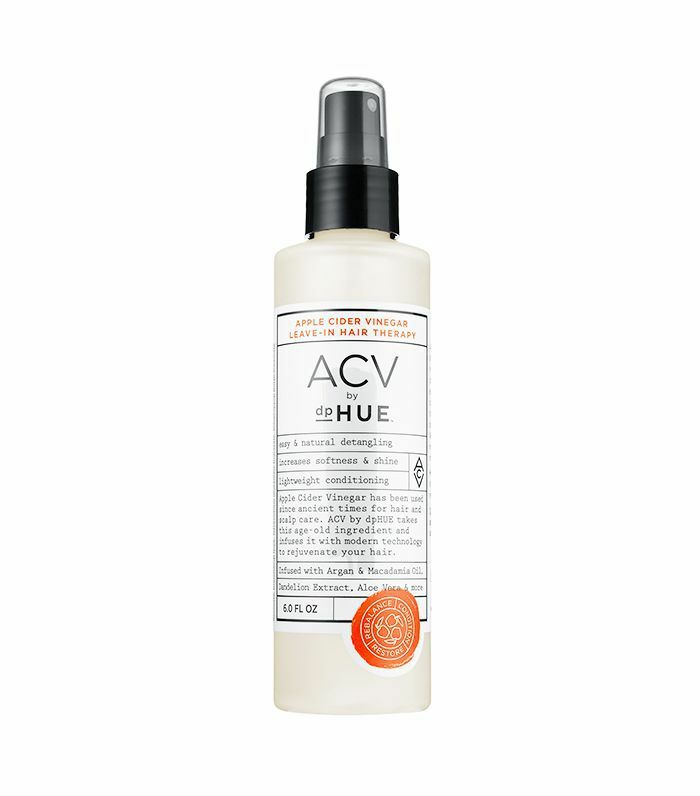 Or, if you’re not one for DIYs, pick up ACV by DpHue ($35)—it’s an editor favorite.